1. 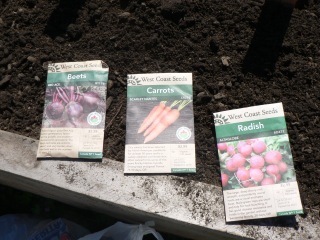 Sow seeds when conditions are right for that particular vegetable . If the soil is too cold or wet the seed will rot. Learn more about germination. 2. Mark out the row with a stick, edge of a hoe or your fingers to the depth recommended on the seed packet. If you plant the seed too deep it will not sprout. 3. Water soil if it is dry. 4. Sow thinly along the row. Never pour directly from the packet, pour the seeds into your hand and then take the vegetable seeds between your thumb and finger. That way you have more control of how much is planted. 5. Cover the seed by gently replacing the soil with your hand or the back of a rake. The general rule of thumb is to cover the seed with soil twice the size of the seed. 6. Firm down the seedbed with your hand or the bottom of a hoe. 7. Water the seed bed with a fine spray of water; too heavy of a water may wash the seeds away. Keep the soil moist but not soggy. 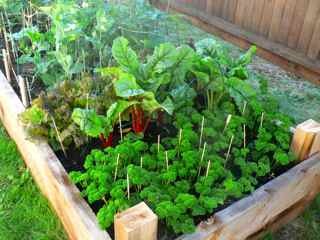 If the weather is hot you may need to water your beds twice a day until the seeds sprout. 8. Thin the plants after 2-4 weeks of growth.